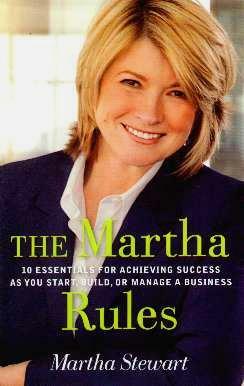 The book's full title is "The Martha Rules - 10 Essentials for Achieving Success as You Start, Build, or Manage a Business". And if anyone should know, it's Martha Stewart. Heaven knows when she even had the time to pen this book. Oh. Yeah. Well, she wrote this a bit later. As we all know, Ms. Stewart is a living legend of a businesswoman - a hugely successful one at that, and whatever Martha utters, we tend to believe and emulate - she's living proof of what success really means. We'd all like to run our own business but realistically, not everyone is cut out to be successful. Who'd we have to work for us? So, Ms. Stewart has outlined ways to help those of us who are wanting to start a business. I agree with her on Rule # 1 - Passion. Why would you choose to go into something you're not passionate about - excited about? Passion is obvious when reading or watching Martha - you feel instinctively that she knows what she's talking about - her passion comes through. "Teach So You Can Lean" and "Build A Team" are just two other chapters in this book. Martha generously imparts valuable and sound advice and we can all learn from her - if not business per se, then how to decorate your home or care for your garden. She also cites many successful and influential business people in their particular fields, how they started out, their mistakes and successes - all have the customer firmly in focus and ensure that we get what we want and need. A perfect balance. Also, Martha Stewart is all about quality. Martha Rules! Visit Martha's website for more information. Conclusion - Valuable information for anyone contemplating starting their own business.